This a good example of the sweet and sour flavours of Moorish cooking. Serve it with game or lamb, or enjoy on its own. Preheat oven to 180 degrees. Wash and wipe quince and place on a large baking tray. Roast one hour or until soft and pink. Place pumpkin on another baking tray, sprinkle with one teaspoon sea salt and drizzle with 60ml olive oil. Shake tray to coat pumpkin with oil and bake 20-30 minutes or until tender. Heat remaining 90 millilitres of olive oil in a large heavy-based frying pan on high heat until just smoking. Add eggplant, season to taste and toss for seven to eight minutes or until golden and tender. Drain on paper towel. Heat 50 millilitres extra virgin olive oil in a large heavy-based saucepan over medium-high heat. Add onion and a pinch of salt and cook for five minutes until soft but not coloured. Stir in capsicum, bay leaves and cumin, reduce heat to medium low, cover and cook for 20 minutes or until soft and jam-like. Meanwhile, peel and quarter quince and cut into 2.5-centimetre dice. Add pureed tomatoes to onion and capsicum and cook for two to three minutes or until warm. 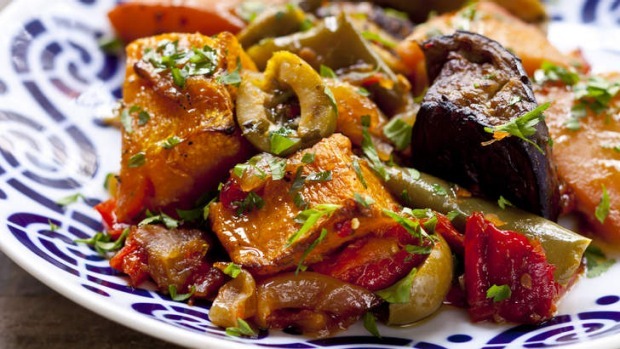 Add pumpkin, quince, eggplant and olives and gently stir together.